Poisoned apples. Glass slippers. Who needs ’em?! 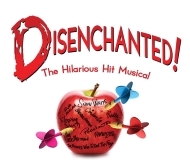 Not Snow White and her posse of disenchanted princesses in the hilarious hit musical that is anything but Grimm. Forget the princesses you think you know. When these royal renegades toss off their tiaras, this hilariously subversive, not-for-the-kiddies musical cleverly reveals what really happened ‘ever after’!